Junior players are fortunate to have the opportunity today to play both indoor and outdoor volleyball. Competitive sand volleyball wasn't an option when I was growing up so I transitioned into it a lot later in my sports career than many young players today. As a coach, it's great to see the passion the juniors are bringing to the game. While it's technically the same sport whether you're playing indoor or outdoor volleyball, there are some differences to consider when you're toes hit the sand. Indoor players are used to playing with a team and understanding the role each position plays. Playing outdoor, you're typically relying on just your partner to help get the win. This is a much different dynamic and learning that one person's style of play and tendencies is critical. Defense becomes a big part of your strategy in the sand. Who will block? Who can play defense behind the block? This year I played back-to-back tournaments with different partners and this was always our starting point. Most players tend to have a favorite side they are more comfortable with and hopefully, you can agree on which suits each of you best. Learn what type of energy your partner has. For example, I like to be loud, so playing with someone who doesn't reveal much emotion on the court can be tough. Cheering, high-fiving and giving encouragement vocally, I'm always positive. I need to know from the outset if this will help my partner play better or if they will shut down if I'm in their face. Each player has his/her own way of getting focused and energized for each point, and there's no right or wrong way. If you're frustrated with each other, it will show in how you play and in the doubles game, you don't have other teammates to change the energy. Knowing the best way to support each other throughout the match can go a long way in having a successful partnership. The obvious difference between indoor and outdoor is the surface you're playing on. Don't underestimate the impact sand has on the game. Most people find it hard to walk in the sand let alone run and jump in it! 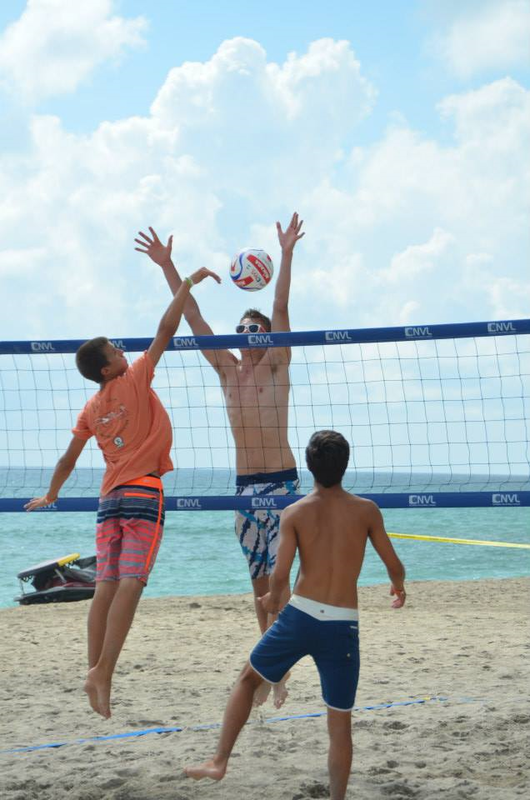 It's always helpful to be tall in volleyball but athletic ability in the sand can easily give you the edge over another player. Your height is out of your control but your movement and training in the sand are not! I encourage juniors to focus on speed and agility to make them better players. Sand sprints and plyometrics - exercise involving repeated rapid stretching and contracting of muscles (as by jumping and rebounding) to increase muscle power - can go a long way in helping your vertical jump and explosiveness. You should also take into account how weather will impact your play. Be prepared for sun, wind and rain. People often ask how I play in the hot sand with bare feet. I think players just become used to it over time but I highly recommend that first-timers wear sand socks. I always have comfortable sunglasses, a hat or visor, warm clothes and sunscreen - lots of sunscreen! - on hand. I remember playing A-level in Fort Lauderdale, FL and I was certain my partner's eyes got burnt! She was uncomfortable playing, her face was fried and her eyes were a strange yellow. Make sure you're prepared for whatever the outdoors may bring your way because there's nowhere to hide when you're playing in sand. As simple as it sounds, it's important to stay hydrated and know when to eat throughout your match. You don't want to find yourself at a disadvantage just because your energy is zapped from the sun and as most athletes know, cramping up from dehydration is the worst! Indoor and outdoor volleyball will always present expected and unexpected elements that impact your play. The best players will be the ones that are able to make quick adjustments. Learning how to adjust to your situation will allow you to play with any partner and against any teams, and this comes with practice! NVL's Club Med Academy will be training the first-ever indoor/outdoor team. 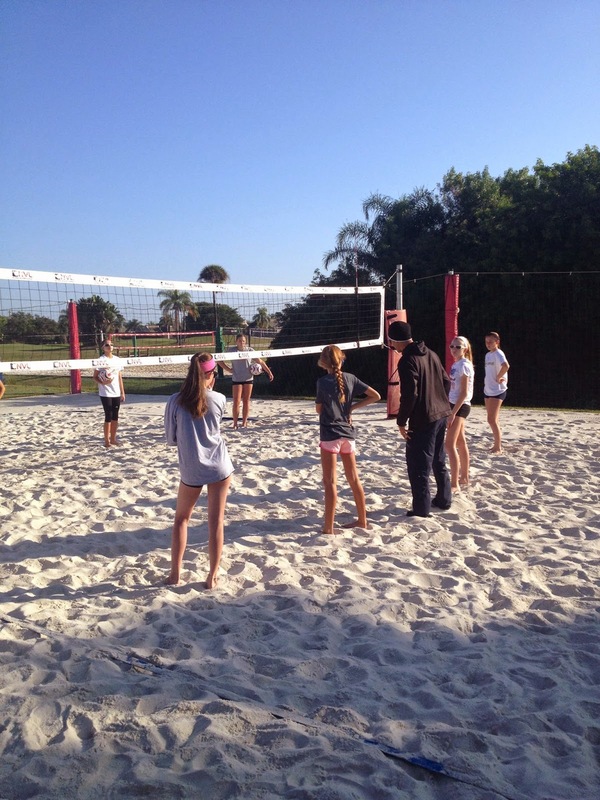 This 14U team will be training on the sand 2/3 days a week and on the hard court 2 days a week. They will compete in 10 indoor tournaments and 10 outdoor tournaments during the indoor season. This team will focus on conditioning and ball control as they will be trained not only by AL-B Hannemann and myself, but also by Club Med Academy trainers, sports nutritionists, and sports psychologists.